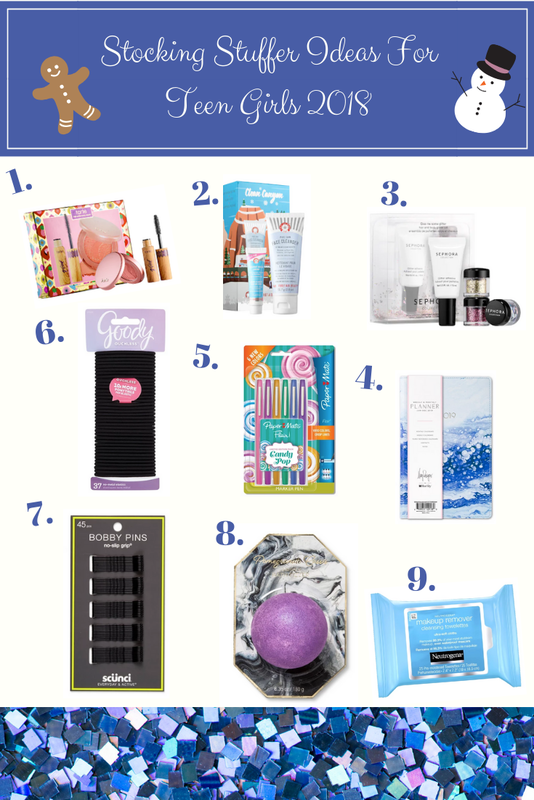 I have been on such a roll with my gift guides and I think this will be my final one for this year! I thought I would end it with my favorite! Opening my stocking was my favorite part of Christmas morning. And I wanted to create a stocking stuffers guide for teen girls. Not only will your teen love these ideas, these are all items I would love to get as well! So these could work from pre teen all the way to late 20's in my opinion! So let's get started! Tarte Beach, Sleep Repeat Mini Set- this set is so cute and is perfect for the stocking! It comes with a mini mascara as well as a mini blush. Best part? It is only $10.00! So super affordable and super cute! You can purchase this set at Sephora.com. First Aid Beauty Clean Canyon Set: I am a huge fan of First Aid Beauty and I think this set would be perfect for someone who would love to try out some new skin care. This set comes with face cleanser as well as a coconut water cream. It is also only $10 and can be found at Sephora.com. Sephora Collection Give Me Some Glitter Set: this set would be perfect for someone who loves everything glitter and sparkly. It would be perfect to create a holiday eye look for Christmas and New Years Eve. This set comes with 3 different glitters and glitter adhesive to help the glitter stick. It is also only $10 and can be found at Sephora.com. 2019 Planner: I think a great item to always receive on Christmas is a new planner for the upcoming year. I love planning everything out and if you have a teen that is involved with a lot of school activities or if you work or go to college, I feel like a planner is a must! I found this super cute blue marble print one from Target.com and its only $9.99! Pens: and to go with a new planner, a new set of pens would be perfect! I know I love pens and I am either always losing them, or using them a lot and the ink runs out. So I think its always important to have a new set of pens! I love this set from Target.com because it comes with so many cute colors to spice up your planner! Goody Comfortable Elastic Hair Ties: THESE ARE A MUST! I don't know about you, but I am constantly losing my pony tails. And I would say a good portion of girls use pony tails on occasion! So I would say throw a pack into whoever's stocking you are doing, because more then likely they are down to like 2 that they guard with their life lol. You can get a pack of 37 for $4.79 at Target.com. Bobby Pins: these are another must. I swear I go through a new pack of bobby pins a month because I always lose them! And they are also super affordable as well. You can get 45 for only $3.99 at Target.com. Bath Bombs: I always find bath bombs super fun! They come in many different colors, scents and some even have added glitter! Target.com has a bunch all raging from $3-$5. I know my nieces love getting bath bombs! Makeup Remover Wipes: I feel like this is something that I am constantly running out of. I think this would be the perfect item to throw in a stocking because everyone could use more makeup remover wipes! They are great at removing makeup, but they are also nice to use after the gym, going to gym class etc. And Neutrogena are of course my favorite! You can get a pack at Target.com for only $4.99. And of course some smaller items you can always through in is gum, candy, chapstick etc. I really hope this blog post gave you lots of ideas! Looking back on when I was a teenager, my mother always used to have some of these items in my stocking for me. And to this day I would still love everything listed above lol!